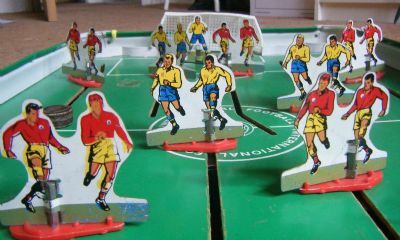 A famous tinplate game from Munro in Canada also available as an Ice Hockey version. Usual push and twist rods to move the players which are lovely tin printed items. The ball is a whacking great metal puck. 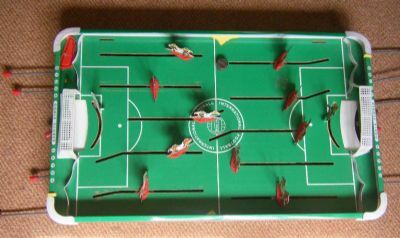 Large tin and hardboard playing pitch with players doubling up to make eleven a side. Plastic goals and giant metal puck for a ball. 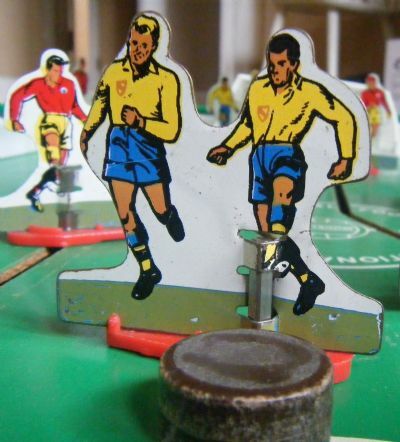 Very colourful tin printed playing figures that move up and down slots in the pitch. 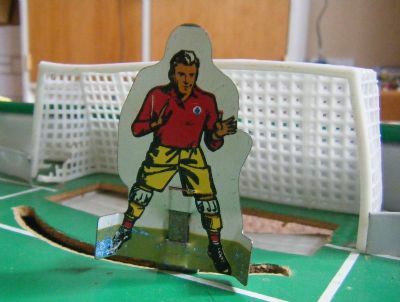 The figures are very nicely designed and printed but the ball however is a massive metal puck no doubt taken from the original ice hockey version of the game. 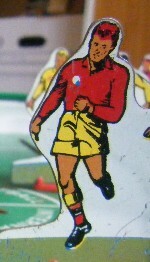 The goalies are large oversized figures that move from side to side. I am sure that the metal puck would knock them senseless.